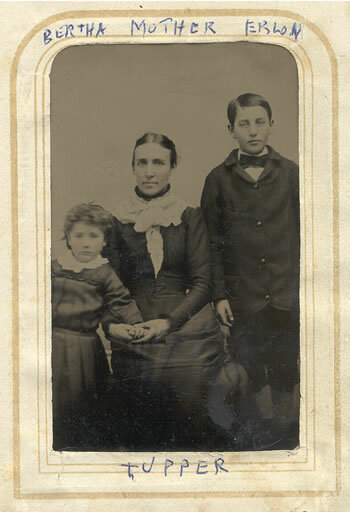 The mother in this picture is Ruth Elizabeth (Bentley) Tupper, and pictured with her are her two children: Bertha Evelyn Tupper on the left and Erlon Howard Tupper on the right. I think Bertha looks to be no more than three in the picture (she couldn't stay still for it), so that dates it at about 1885. That would make Erlon ten or eleven and Elizabeth thirty-five. I believe the handwriting belongs to the little girl in the picture, Bertha Evelyn (Tupper) Conroy. She lived until 1980. Of course, the picture is a tin type and has no photographer information.